The safest way to thaw a whole frozen turkey is either in the refrigerator or in cold water. Never thaw your turkey at room temperature! This method of thawing a turkey is the safest, as it keeps the meat cold until it is completely defrosted. Allow 5 hours of thawing time per pound (10 hours/kg). Health Canada recommends that your refrigerator is set at 4 °C (40 °F). Keep the turkey in its original wrapping. In a large container, cover the turkey completely with cold water. Change the water at least every hour. Allow 1 hour of thawing time per pound (2 hours/kg). Once thawed, keep your turkey refrigerated and cook within 48 hours. Some products are meant to be cooked from frozen; always read your product label carefully. There are absolutely no quality differences between fresh and frozen turkeys. Frozen turkeys are flash-frozen immediately after they are packaged to 0°F (-17°C) or less, and are kept frozen until they are purchased. Once thawed, the meat of a frozen turkey is virtually as fresh as the day it was packaged. Fresh turkeys are chilled after packaging, rather than frozen. Because they require special handling and have a shorter shelf-life than frozen turkeys, fresh turkeys are often more expensive than their frozen counterparts. Fresh turkeys should have a best before date on their packaging. If not, be sure to inquire where you purchased the turkey. When deciding between a fresh or frozen turkey, choose the product that works best for you. Frozen turkeys can be purchased in advance, allowing consumers to take advantage of special sales and coupons. Fresh turkeys, conversely, do not require additional time for thawing. 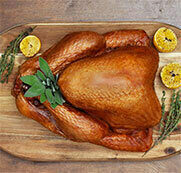 For information on thawing turkey cuts, visit our TURKEY CUTS section.